Pumpkin Knots: slightly sweet, moist and light in texture, golden in color with a mild pumpkin flavor. 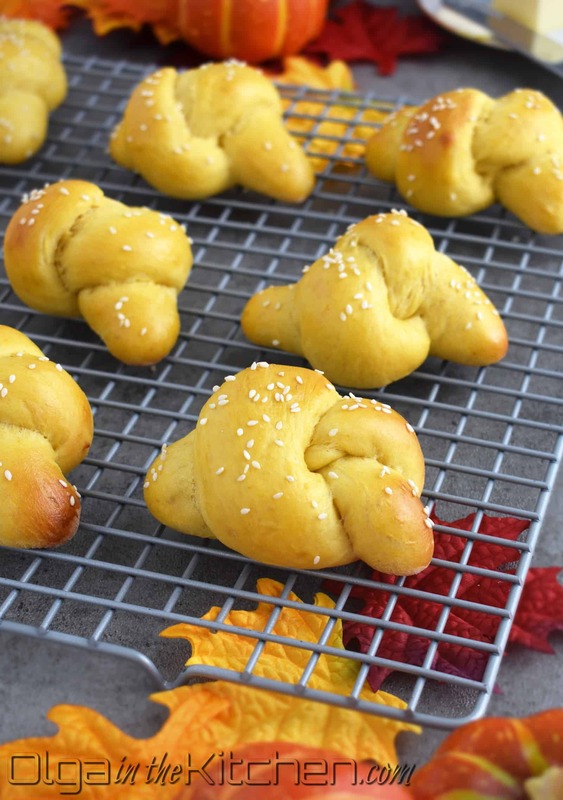 These knots will complete any breakfast or afternoon tea. 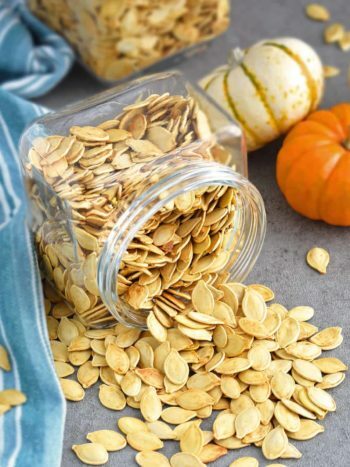 My parents oven-dry the pumpkin seeds and use the pumpkin for homemade pumpkin puree that mom later used in that pumpkin bread. 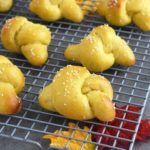 Just like that bread, these rolls also have the perfect amount of sweetness, the dough texture is so delicious – it’s even hard to describe, but while eating these I kept thinking about mom’s pumpkin bread. 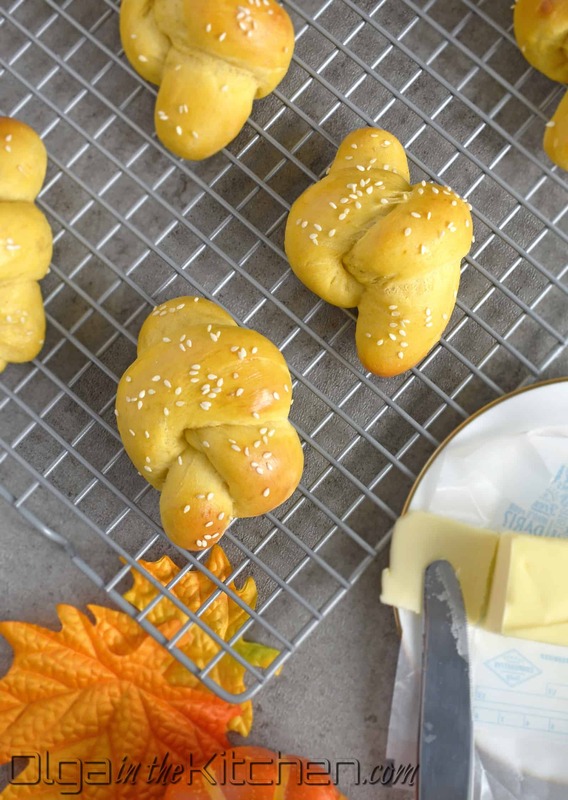 The shape of these knots are fun for anyone, adults or kids, and some sprinkled sesame seeds make these look extra festive. 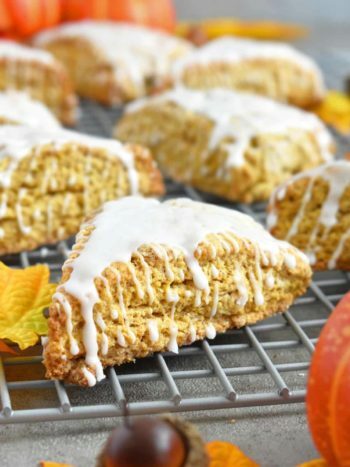 These are so easy to make, just take a bit of time for dough to rise and then rise again before baking, but in couple hours – you’ve got a delicious treat to go with that cup of tea! 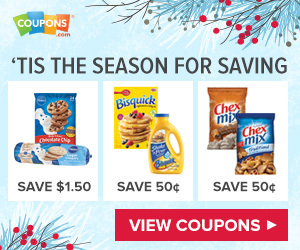 You can also spread some butter and jam on these and you won’t stop eating them! 1. In a small bowl or a measuring cup, add and microwave to warm 1/2 cup whole milk. Sprinkle 1/4 tsp sugar and 2 1/4 tsps active dry yeast. Stir gently to combine and set aside to rest until foamy, 5-7 mins. 2. In a medium bowl, combine 2 tbsps unsalted softened butter, remaining sugar from 1/3 cup, and 1 tsp table salt. With help of spatula, press butter down into sugar and salt, until combined. 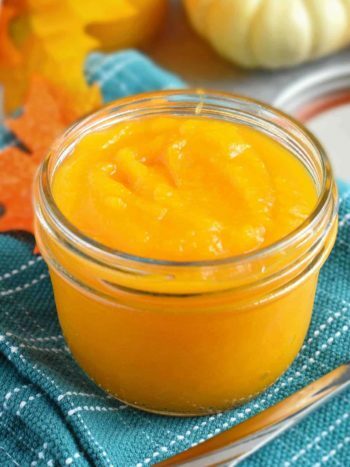 To the bowl with butter, add 1 egg and 1/2 cup canned pumpkin – stir to combine well. 3. Add the yeast mixture to the batter, stir to combine. Now, sift (or gradually add if already sifted) about 3 cups all-purpose flour. Stir with spatula and finish kneading with hand until flour is incorporated. The dough will be a bit sticky, but soft. If it turns out way too sticky, add few tablespoons (tablespoon at a time) of all-purpose flour; Do not add too much flour or the knots will turn out hard in texture once baked and even harder the next morning. Cover the dough with plastic food wrap, and leave at room temperature for 1 hour until the dough is doubled in size. 4. 1 HOUR LATER: Line 2 baking sheets with parchment paper and set aside. 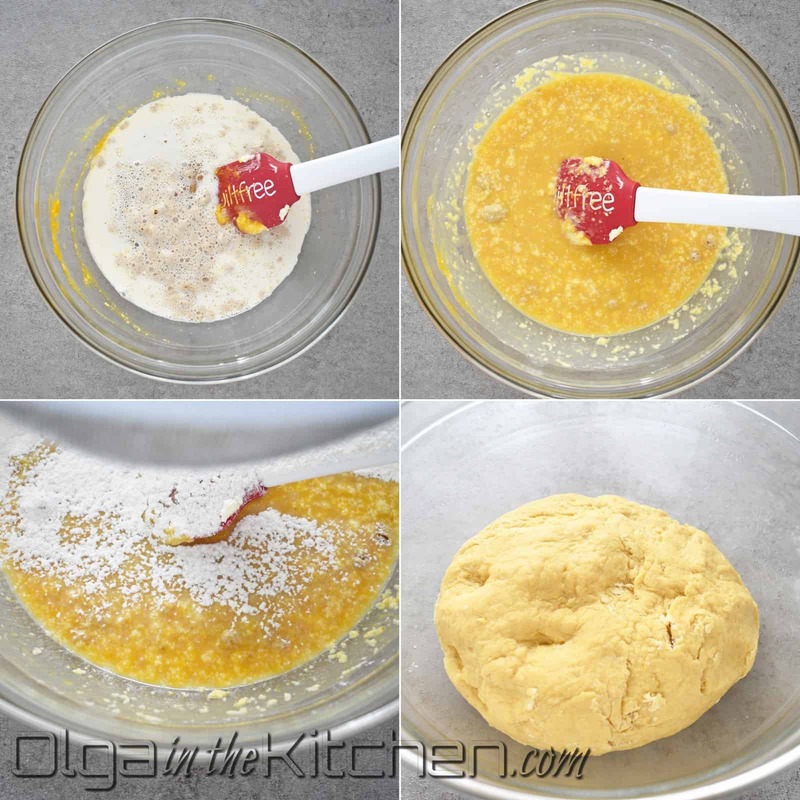 Punch down the dough to deflate and transfer the dough onto a lightly floured surface. Knead few times and divide the dough into equal-to-similar 16 pieces. 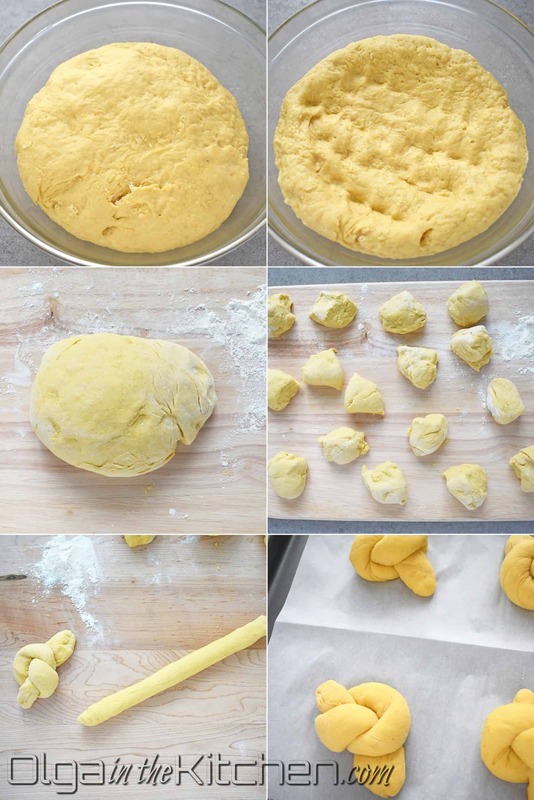 Roll each piece to a 9-10” rope, make a knot and transfer to a baking sheet, 2” apart (add very little flour when needed, while rolling the dough ropes). Cover knots with clean kitchen towel and place in a warm, draft-free area until knots are doubled in size, for about 30-40 mins. (with 10 mins remaining, preheat the oven to a 350°F). 5. In a small bowl, whisk 1 egg. Brush egg onto pumpkin knots, covering all the areas. Sprinkle with sesame seeds. Bake for 15-17 mins, until golden. Enjoy while warm and fresh. Cover with plastic food wrap to keep them light as feather the next day as well! 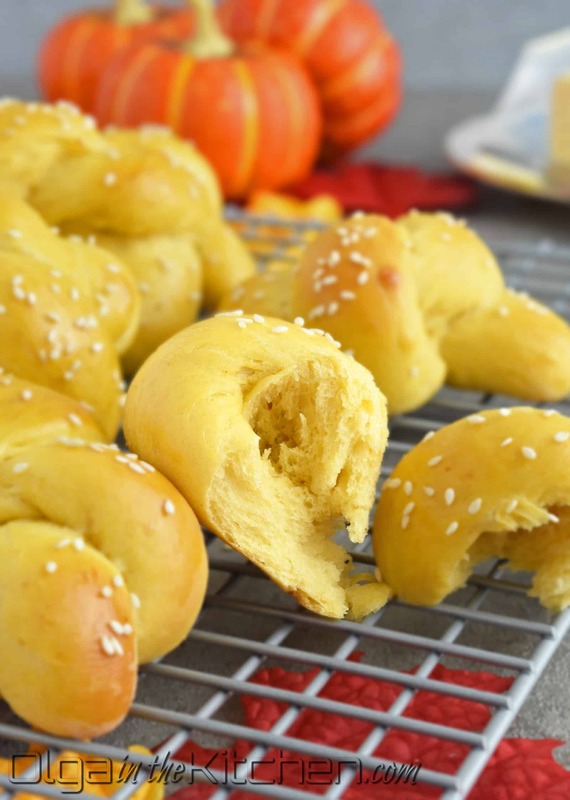 Pumpkin Knots: slightly sweet, moist and light texture, golden in color with a mild pumpkin flavor. 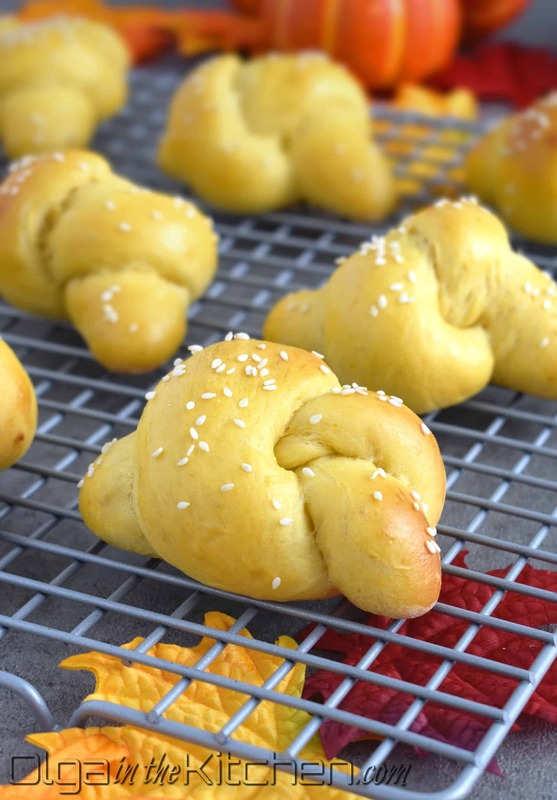 These knots will complete any breakfast or afternoon tea. In a small bowl or a measuring cup, add and microwave to warm 1/2 cup whole milk. Sprinkle 1/4 tsp sugar and 2 1/4 tsps active dry yeast. Stir gently to combine and set aside to rest until foamy, 5-7 mins. In a medium bowl, combine 2 tbsps unsalted softened butter, remaining sugar from 1/3 cup, and 1 tsp table salt. With help of spatula, press butter down into sugar and salt, until combined. 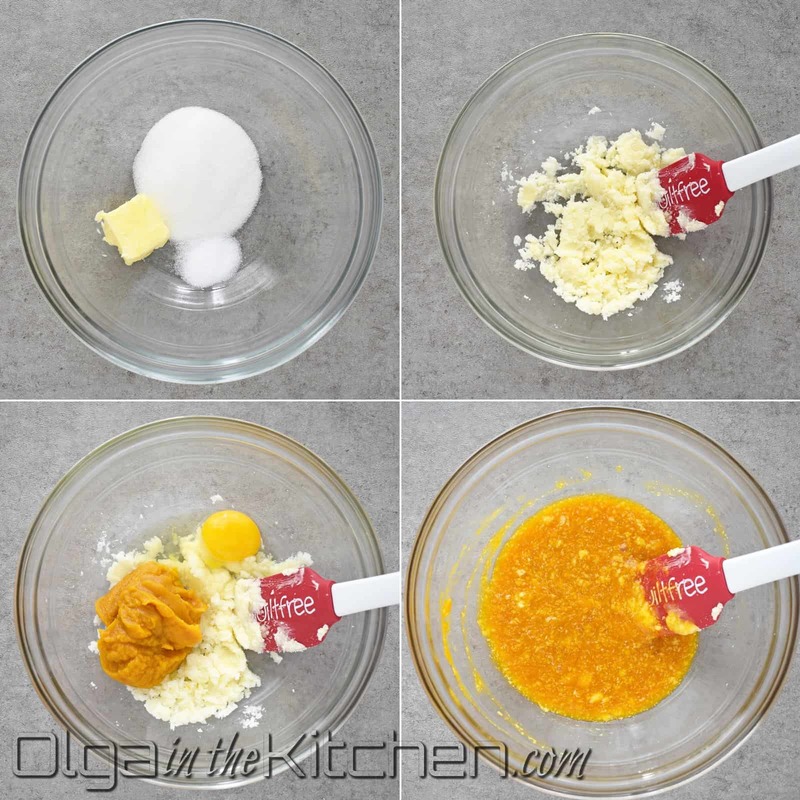 To the bowl with butter, add 1 egg and 1/2 cup canned pumpkin – stir to combine well. Add the yeast mixture to the batter, stir to combine. Now, sift (or gradually add if already sifted) about 3 cups all-purpose flour. Stir with spatula and finish kneading with hand until flour is incorporated. The dough will be a bit sticky, but soft. 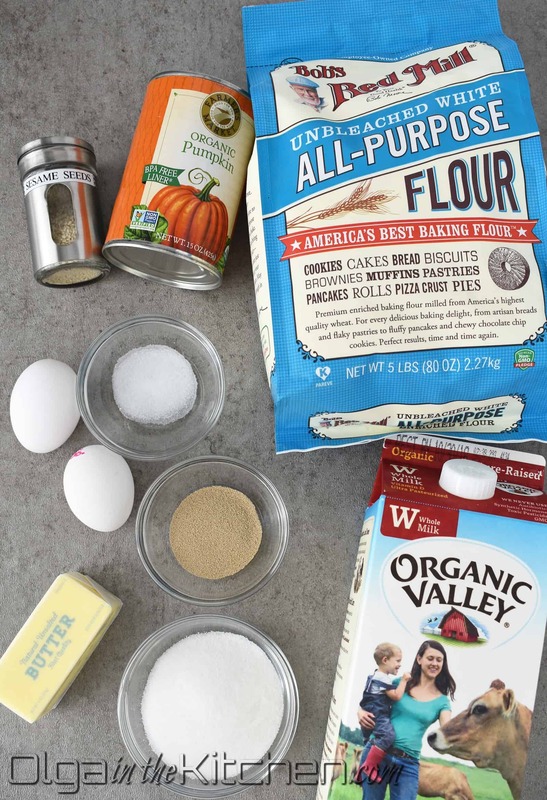 If it turns out way too sticky, add few tablespoons (tablespoon at a time) of all-purpose flour; Do not add too much flour or the knots will turn out hard in texture once baked and even harder the next morning. Cover the dough with plastic food wrap, and leave at room temperature for 1 hour until the dough is doubled in size. 1 HOUR LATER: Line 2 baking sheets with parchment paper and set aside. 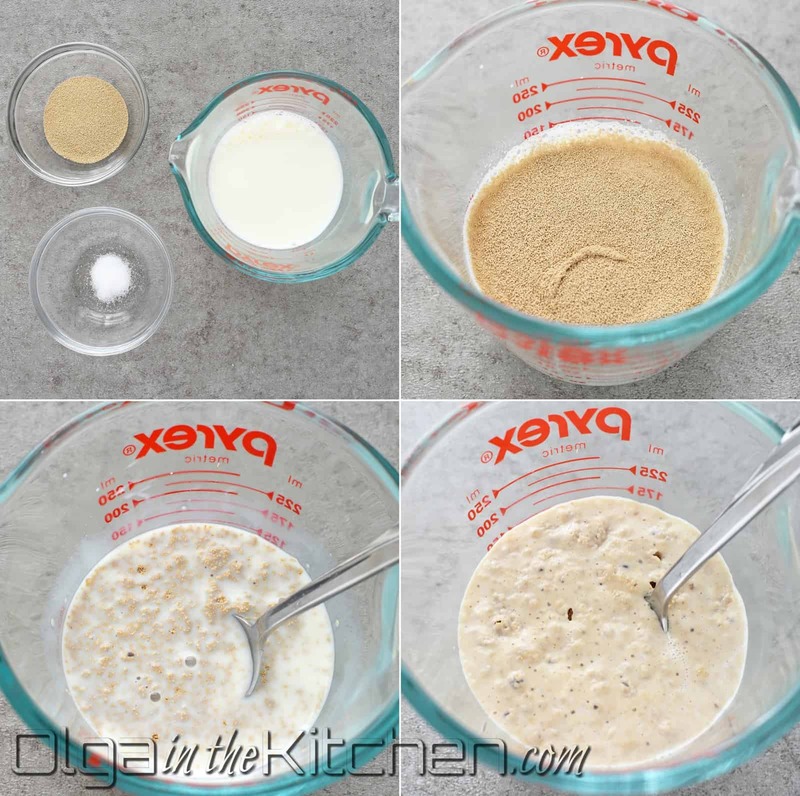 Punch down the dough to deflate and transfer the dough onto a lightly floured surface. 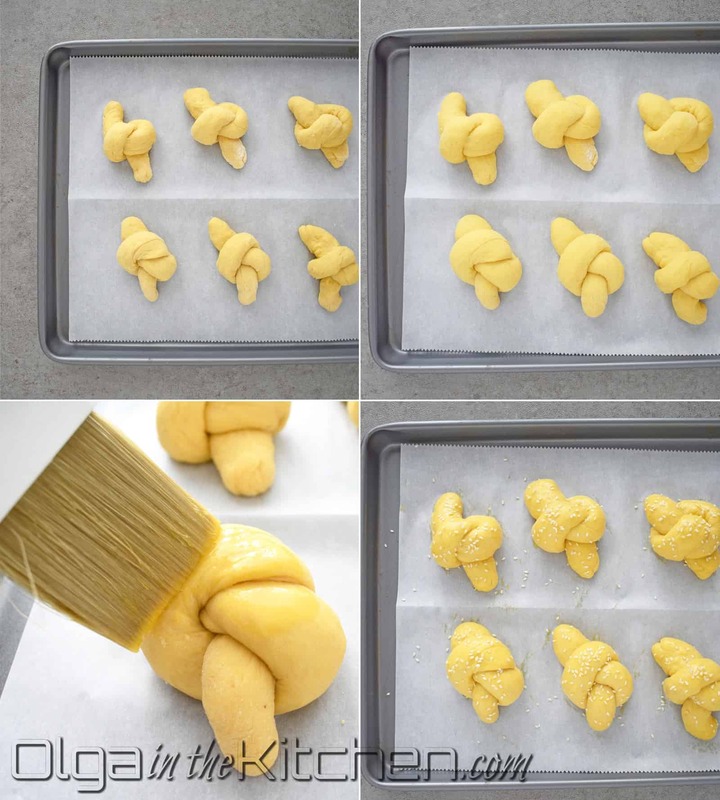 Knead few times and divide the dough into equal-to-similar 16 pieces. Roll each piece to a 9-10” rope, make a knot and transfer to a baking sheet, 2” apart (add very little flour when needed, while rolling the dough ropes). Cover knots with clean kitchen towel and place in a warm, draft-free area until knots are doubled in size, for about 30-40 mins. (with 10 mins remaining, preheat the oven to a 350°F). In a small bowl, whisk 1 egg. Brush egg onto pumpkin knots, covering all the areas. Sprinkle with sesame seeds. Bake for 15-17 mins, until golden. Enjoy while warm and fresh. Cover with plastic food wrap to keep them light as feather the next day as well! I saw you post these this morning and I started baking. 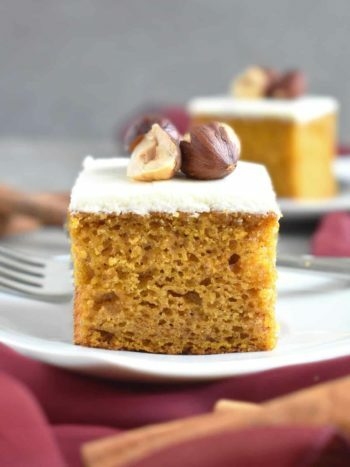 These are so different from other pumpkin recipes, and have this fun shape and the taste of these is incredible. I had one, then second, then fourth lol because of the dough texture it’s impossible to stop eating these. They literally flew into my mouth one after another :D. Just like your other recipes, this is another very tasty dessert!! These turned out amazing! I thought these knots are going to be hard to tie, but the dough is so easy to work with. These taste delicious, and going straight into my favorite recipes book. Thank you for your hard work, I cannot wait to see what you’ll have closer to Christmas! !